With more time off school and a long bank holiday weekend, Easter’s a terrific time to cross the pond for an awesome American ski trip. The weather’s warmer, days are longer and the resorts are buzzing with the likes of spring concerts, egg hunts and sunrise Easter services on top of the mountains. Catered chalets aren’t as easy to find in the USA as they are in Europe, so the few we do have are often in high demand on peak weeks like Easter. Rightly so, as they make for a brilliant holiday on the hill; breakfasts, afternoon teas and suppers (with wine) are included in cosy, sociable lodgings in terrific locations. One of our favourites is Chalet Victoria, which has a handy position right in the centre of Breckenridge. The local churches are about five minutes’ walk away if you want to attend an Easter Sunday service, while Ollie’s Pub & Grub, Bubba Gump Shrimp Co. et al are within easy reach for good old American Eastertime feasting. If you’d rather have more choice when it comes to resorts, facilities and availability, it might be worth opting for a hotel holiday instead. Hotels are the main type of ski accommodation stateside, and if you’re happy with something slightly different from traditional chalet catering, you’ll find a huge range of properties and resorts to choose between. 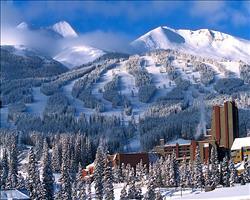 As you’d expect from our American cousins, their ski hotels include some of the biggest and best in the world. The Beaver Run Resort is one of our favourites when it comes to location. You’ll find it right at the foot of Peak 9, letting you hop straight on the chair lift first thing in the morning, glide down Breck’s signature cruisey groomers (we like Columbia) and be back in time for breakfast! If you’re looking for luxury this Easter, it doesn’t get more glamorous than Aspen. The high end logings here - like the Sky Hotel - host some of the most sought over drinking and dining spots in the mountains, which you’ll have moments from your bedroom or suite. There are all kinds of 2 and 3 star options too, for when all you need is a simple place to sleep. A great example’s the Rabbit Ears Motel - and not just for its Easter themed name, or for the fact that the famous hot springs are over the road... It’s in the middle of downtown steamboat with the ski bus stopping right outside for a hassle free week on the hill. Apartments become your very own ski pad in the mountains. Spend daytimes enjoying the springtime weather on the slopes, then escape to your personal bolthole for lazy evenings with your nearest and dearest. And the American ski towns really know how to make self-catering a breeze, with big food stores and affordable restaurants letting you cook in or eat out as much as you fancy. But the really great thing about self-catering in America is that the accommodation (often in the form of ‘condo’s) tends to be a lot roomier on this side of the pond. You’ll find that many apartments have cracking locations too, like the ones at Zephyr Mountain Lodge in Winter Park. Even if the snow doesn’t hold out for doorstep skiing by this time of year, they’re only 30 metres from the Zephyr lift – letting you get straight out onto the slopes every morning. If you like to be close to the town centre for things to do in the afternoons, we love the Pine Ridge Condos in Breckenridge - the main street is under a five minute walk away.